ABC streamlines the building process through the use of precast materials in an effort to reduce construction time, traffic disruption and costs. Adam Stockin, a supervising structural engineer for WSP, and Suriyanarayanan Sadasivam, a lead researcher for the firm’s advisory services, discussed their ongoing project to identify challenges associated with quality assurance for various aspects of ABC methods. Such aspects include prefabricated elements, placement, transport and handling. WSP’s research is part of a Federal Highway Administration effort to fill in information gaps related to ABC across nationwide projects. 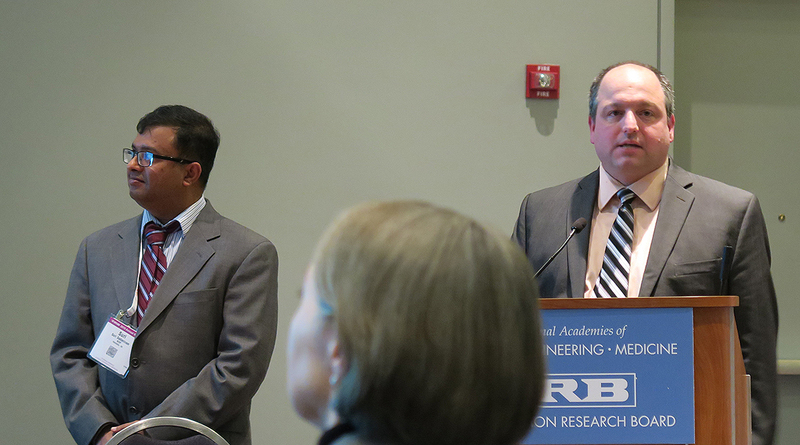 Stockin and Sadasivam delivered their presentation Jan. 13 at the Transportation Research Board’s annual meeting. ABC methods are popular because they result in fast-moving projects. For example, ABC can allow for a bridge replacement within 48 to 72 hours rather than years. Stockin said one goal is to make sure quality is not sacrificed for speed. The project, which started in September 2016, will result in guide documents on ABC, including reference tools for how to conduct field inspections. The team’s final report should be ready this summer or fall. WSP’s team tried to understand current best practices on ABC by reviewing FHWA documents and surveys from states. They examined State Highway Administration Quality Assurance programs for both ABC and conventional bridge construction, as well as case studies and analyses of nationwide projects. Specifically, the team concentrated on projects in Utah, Iowa, Vermont, Tennessee and New York. Sadasivam said that, although ABC projects exist in at least 48 states, not every state has specific design standards for ABC. The guidelines are meant to help states learn from each other and improve their projects rather than present a set of firm requirements. Stockin and Sadasivam were two of the five presenters who appeared during the session. Several speakers were waylaid by a snowstorm that blanketed the Mid-Atlantic. Atorod Azizinamini, chair of the Department of Civil and Environmental Engineering at Florida International University, delivered remarks on the use of ultra-high-performance concrete (UHPC) as a solution for bridge repair. UHPC is a durable material that can be used to retrofit and upgrade bridges. For example, the substance can be used to repair a corroded pillar if the contaminated concrete is removed and new UHPC is filled in as reinforcement. It can also be used to fuse pieces of a bridge, such as columns and cap beams. Azizinamini noted that UHPC is less corrosive than normal strength concrete. Repairing and retrofitting is a necessary step in redressing the nation’s aging bridges, Azizinamini said. Over 614,000 bridges comprise the National Bridge Inventory. Azizinamini pointed out that, in 2010, about 200,000 of these bridges reached their 50-year lifespan. By 2030, that figure is expected to increase to 400,000 bridges. According to Azizinamini, about 204 million crossings occur over substandard bridges every day. He acknowledged that he doesn’t know what transportation will look like in the future, but he said that $123 billion is needed to shore up the bridges that exist today. “All those factors say we need to pay more attention to repair, upgrade [and] retrofit,” Azizinamini said. A pedestrian bridge near Florida International University collapsed March 15, just days after it was installed using ABC methods. Six people were killed. Azizinamini told Transport Topics he does not know whether reconstruction attempts for the pedestrian bridge are underway.